What makes digital photo organizers tick? Keywords or tags are the hottest topic when it comes to organizing your pictures. The standards used for capturing photo keywords and saving them to the actual image files are XMP and IPTC. It is important to understand what these terms mean and how to use them, but it is also important to understand how the actual keywords end up being added to your image files. So what does an image organizer software do in order to create and add keywords to image files ? The database is the heart of your digital photo organizer software. Whether you’re using Adobe Lightroom or iMatch, there is one important thing to know and understand. If you’re creating and using keywords (or tags), your software will be using a local database. Now, this database is not a database server as MySql, or Oracle or SQL Server, but rather it is a simple file that contains “metadata” about each image on your hard drive. It contains information like: thumbnails, EXIF data extracted from the images, keywords that you create and other similar information. This is needed in order to optimize any searches that you would want to perform. It is a lot more efficient to search through a file than to search through image folders. Once the metadata of a particular image has been located in the database, your software will be able to show you the actual image you’re looking for. If your software allows you to create keywords then it is using a database. This database is what makes your software tick. The database is the intermediary storage between your software and your actual image files. In order for your keywords to be attached to your pictures, your software must have the capability to save keywords from its internal database to the actual image files. Unless your software does this, your keywords are confined to your software and they are not mobile. How does digital photo organizer software work? Boy, this is a long title, but I couldn’t think about anything else more creative to capture what I want to explain. I want to describe what your software goes through in order for you to see the pictures on the screen. So here they are. Step 1: Transfer images from camera to some folder on your computer. 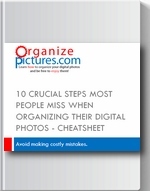 Step 2: Bring up your digital photo organizer and look at thumbnails. Again, this is what you would normally do in order to look at the images you have just transferred. It doesn’t really matter what software you’re using…the idea is that you’re trying to see your pictures on the monitor, cause it looks a lot better on a large monitor than on the small camera display. When you navigate to the folder containing the new pictures, your software will most likely show you some thumbnails that it will create as you navigate to the right folder. The size of the thumbnails can vary depending on what software you’re using. Thumbnail make navigating your picture collection a lot faster…I mean a lot, a lot faster than just displaying the full picture. So, thumbnails are part of any imaging software. Step 3: Your software now works behind the scenes. This might vary based on the software but the sequence is similar. Here is what happens in the background when you add new pictures. The internal database file is updated with thumbnail information and EXIF data generated automatically by your camera. The EXIF information is simply read and inserted in the database. Remember that your software always uses the database file that it created when initially installed. This database file contains mostly just text and pointers to image files. This database file is an optimized structure that will allow your software to display the pictures you’re looking for very fast. This essentially means that your software doesn’t exactly look directly at your folders that contain your pictures, but rather it looks first at its own database which in turn contains pointers to your actual image files. Step 4: You create keywords and assign them to your pictures. Your digital photo organizer software now allows you to create new keywords or use existing ones to assign to your pictures. You can usually just drag the keywords to your picture thumbnail or your thumbnail to the keywords…either way it has the same effect. Here is the key though…the keyword to image assignment is only saved to the internal database and NOT to your image files. Unless you explicitly instruct your software to save the keywords to your image files this will not happen. So, you have to make sure you understand how your software does that. Here is the key though…the keyword to image assignment is only saved to the internal database and NOT to your image files. Unless you explicitly instruct your software to save the keywords to your image files this will not happen. So, you have to make sure you understand how your software does that. Step 5: YOU SAVE the keywords to your image files. This is the step in which you make the keyword assignment permanent. Some software will do this automatically, some do not, and some do not have this feature at all. Software like ACDSee will allow you to create keywords and assign them to your pictures, but it will not allow you to export those to IPTC/XMP fields and insert them in you image files. If you buy the ACDSee Pro version, then you can do this step, but if you buy the personal version, you can’t. So, watch out before investing in a program that would only claim that it allows you to create keywords. Sanjay…thanx for your comment. The Adobe products support XMP obviously. IPTC support is a little hard to find. One free program is xnView. Picasa doesn’t support IPTC…last time I checked.